Let’s start off this assessment of the new 2008 Honda Accord by what it does when it’s no longer a Honda Accord—or more accurately when it’s reduced to a twisted, unrecognizable mess of steel after a serious collision. In May 2000, Honda unveiled its indoor omni-directional Real World Crash Test facility in Japan, the world’s first indoor all-weather, vehicle-to-vehicle crash test center. What they do all day at the test center is destroy Honda vehicles, taking in all factors as direction, speed, and weight. After the destruction they gleefully sit down in highly scientific labs and crunch all the data they have gathered to come up with new safety technology. 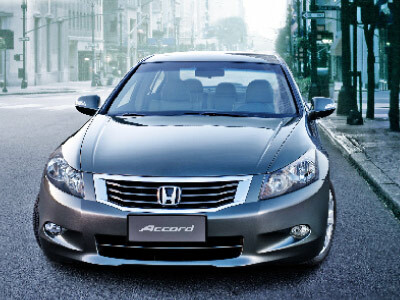 One such technology is the Honda G-Force Control Technology, and it’s right there in the new Accord. What it does is, in the event of a collision, the destructive energy is dispersed and absorbed by the car’s frame so that instead of you taking all that force (and possibly dying), the car takes most of the load (you could still die; stupid driving confounds science). Not only that—G-Force Control allows a pedestrian hit by your oncoming car a fighting chance to live. There are five key points in the front part of the car where a shock-absorbing structure is placed, allowing the car to disperse the force unto itself what could have been fatal to a pedestrian.